There can only be one victor in the end of a regular season campaign, but for the founding clubs of the Canadian Premier League, success can be measured in many different ways. In the build-up to the inaugural 2019 season, CanPL.ca asked each coach a simple question: How do you define success in year one? For York 9 FC boss Jimmy Brennan, there was only one answer – by winning. “I want to win championships, and bring trophies to the region,” Brennan told CanPL.ca. “That’s our goal as a club: to play a good brand of football and be successful by winning. FC Edmonton coach Jeff Paulus agreed with Brennan’s straightforward point, offering that he, too, prioritizes the procuring of silverware. But, to that end, Paulus also has a few pride-driven objectives, too. 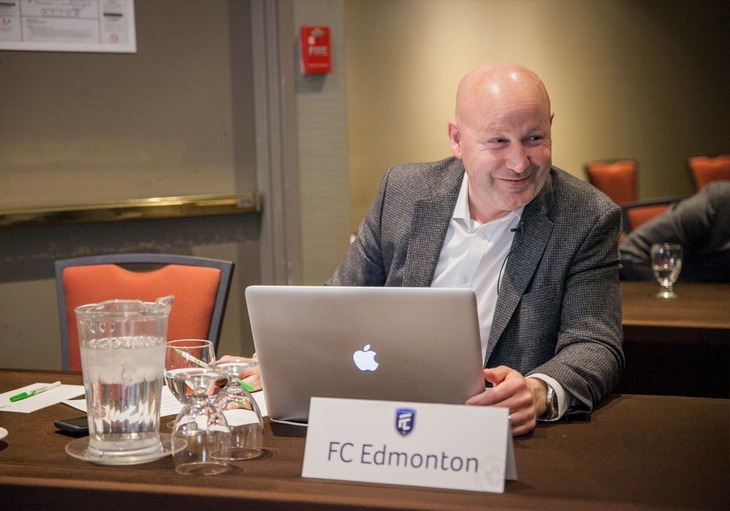 While his goals may be clear, Paulus also stressed that player development is also a priority, explaining that he’s looking to bring in young players from the FC Edmonton Academy right away and help them reach their fullest potential. To that end, many of the CPL’s coaches offered a similar take, with Pacific FC’s Michael Silberbauer stating his intention is to try and “make dreams come true” for his players. FC Edmonton head coach Jeff Paulus during the CPL-U SPORTS Draft. HFX Wanderers FC tactician Stephen Hart agreed that the implementation of a vision would be the key to defining success in the club’s early years of inception. “I always, in the back of my mind, want my teams to play in a certain way, and … if I can see the process fall into place and the results coming at the same time, I think that would be very successful to build upon,” Hart offered. Cavalry FC head coach Tommy Wheeldon Jr. has another vision for success, though. He’s measuring his team’s impact by the reputation his club garners. “If teams are coming to Calgary and they’re sitting back and defending deep because they’ve given us respect, or we’re being talked about in the media, or our players are being looked at for the national team, that, for me, will be success,” Wheeldon Jr. said. That community response was the basis of Valour FC boss Rob Gale’s own answer to the question. Like his competitors, Gale stated clearly he’s hoping to win games, championships and the like, but added that the way the club integrates into Winnipeg’s culture matters, too. “I think as you build a brand with that community involvement, it’s getting our identity out there, establishing ourselves as a professional sports franchise in our market, building a fanbase, building that community feel, the fact that we’re by Canadians, for Canadians, by Manitobans, for Manitobans, with Manitobans,” Gale said.